Goddess Sandals Gold Features .Includes: 2 Flat Gold Sandals with Wrap Around Ties.Available Size: Adult - Small (5-6) Adult - Medium (7-8).Features: Gold leaf decoration. 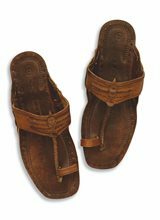 Roman Sandals Brown.Includes: One pair of Brown Roman Sandals.Size: One Size Fits Most Adults.These roman sandals are simple and complete any greek inspired costume. 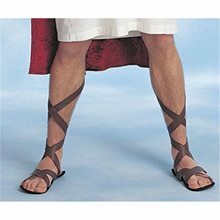 They are the perfect match for the casual toga , the more high end tunic, or the warrior uniform. Where are you going to find a shoe that is so versatile today? 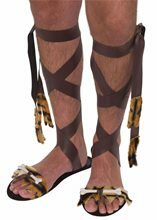 Sandals are brown in color and tie up the leg. *Costume Not Included. 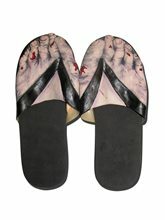 Female Zombie Feet Sandals.Includes: One Pair of Female Zombie Feet Sandals. Available Size: Womens - Medium. *Costume Not Included. Accessories Sold Separately. 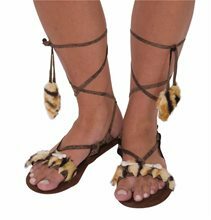 Complete your zombie costume with these creepy Female Zombie Feet Sandals! Bollywood Foot Decorations.Includes: Two Bollywood Foot Decorations. Available Size: One Size Fits Most Adults and Teens. *Costume and Accessories Not Included. Sold Separately. Ready to bring out the Bollywood Bhangra in you this Halloween? In search of something to help you put together that awesome Indian dance number? Then these Bollywood Foot Decorations are just what you?re looking for! This fashionable accessory features two foot decorations.